Part of what informs my life is my ongoing assimilation into American culture. The journey began in 1961. It was cold and snow was piled high on the tarmac of Idlewild Airport (now JFK International) and on New York City street corners. For a wide-eyed, frightened, young boy, but 7, and who didn’t speak a word of English, the City was something out of an epic, something only imagination can conjure in big terms, colossal, I don’t know, something seemingly impossible though there he found himself in Herald Square, W34th Street, in 1961. What I didn’t know is that to take in a powerful culture like this, I had to give something up – and if not give it up entirely, tuck it away somewhere. The first change, the one aspect of my life I had to immediately push away was fútbol. Not the game, rather the word. In it is a world. Only this world is not the U. S.’s. No longer would it be fútbol or even futbol, the name given by Spanish speaking countries to the universal game. Football originated in England. FIFA (Fédération Internationale de Football Association) lists 43 affiliated nations that use fútbol and futbol. The United States and Canada are the only two members, of a total of 45, that call the game soccer. Soccer has been the prevailing term for association football in the US, Canada, Australia, and New Zealand, where other codes of football are dominant. An initial code of football involves the helmet. When this kind of protection becomes central, the culture, unknowingly, adjusts its gaze on that one vital component. This change, this new point of view, is fraught with implication; it changes the values of a culture, an important factor in determining the meaning of football. The head in fútbol is used for thinking, planning – and heading. The head is a weapon in football. The critical thinking happens on the sidelines and in booths, thinkers assisted by technology – computers, cameras, software, communications technology – that reflect our very own condition, the fan looking in, the fan trying to read the very confusing kernels of information streaming from various points of origin, most of which are unknown. This is not to suggest that there’s no thinking on the Gridiron. There is – but it’s short lived, reactionary, compressed, almost ephemeral, fleeting – gone once territory is captured. Followed by chatter. Followed by next. In-between a beer maybe. Violence, the taking of territory, anxiety over time – the defining characteristics of football that pushed aside the grace of the world’s game, fútbol. Instantly I learned that force is privileged in this foreign place. Force and violence, that is. The taking of territory by guile and violence, all neatly wrapped in a spectacle that generates huge amounts of money in a merciless, vertical economic reality. You’re in or your out. That’s it. Play or go home. The message, as a young boy trying to take it all in, was clear. Totally. Riches reside at the top, the penthouse – or in the case of football, the luxurious owner’s box. On the field the bodies lay wounded, forever changed in a quid pro quo: money for your body. A football contract is about the value of a player’s body – that’s it. Heavy snow fell the night before John F. Kennedy’s inauguration, January 20th, 1961. We flew into New York a few days before. The election of 1960 had been close, and the Democratic Senator from Massachusetts was eager to gather support for his agenda. Kennedy attended Holy Trinity Catholic Church in Georgetown that morning before joining President Eisenhower to travel to the Capitol . The Congress had extended the East Front, and the inaugural platform spanned the new addition. The oath of office was administered by Chief Justice Earl Warren. Robert Frost read one of his poems at the ceremony. Kennedy’s image was grainy on the Martinique Hotel’s TV. But I listened and my father translated. And so, my fellow Americans: ask not what your country can do for you—ask what you can do for your country. My fellow citizens of the world: ask not what America will do for you, but what together we can do for the freedom of man. In 1961, the AFL and NFL agreed to merge together to create one “Super League” called the NFL. In this agreement between the AFL and the NFL they arranged to begin playing a championship game between two conferences the AFC and NFC after the 1966 season. Originally the Championship game was named the AFL – NFL Championship, but it was soon nicknamed the Super Bowl. The first Super Bowl, though, between the NFL’s Green Bay Packers and the AFL’s Kansas City Chiefs, wasn’t so eagerly anticipated. With Green Bay’s perennial dominance the only question seemed to be was how large would Green Bay’s margin of victory be. Even though the tickets cost only $12, the game still wasn’t a sellout. The NFL machinery was in motion. The spectacle was born. I was terribly excited – all 7 year old boys, mostly Irish and Italian at St. Gabriel’s School in Riverdale, Bronx, New York, played out their athletic fantasies in the schoolyard. I was looking to find ways in, trying to understand and learn English – until I heard someone call out, Spick. Spick. I didn’t have to look long. My way in was fighting, just being tougher then someone else, not backing down. Respect. Unconsciously, I was taking in a world awash with violence, anger and confusion. It came from all sides. The body of Christ, I heard the priest say in front of a crucifix held high for all to see the suffering. A political movement for equality played on TV, harsh images of German Shepherds attacking Black people. The Cuban Missile Crisis paralyzed the world for 13 days, a confrontation between the Soviet Union and Cuba on one side, the United States on the other. From October 14 to the 28th, 1962, the world stood at the brink of nuclear war; it was the very real moment when we first understood mutual assured destruction. How long do I have? I began thinking then. How am I going to live with this? Certainly not abide. If I’m going to go, I’m going to go my way. Everything around me told me as much. On November 20th, 1963, at 12:20PM, in Dealey Plaza, in Dallas, Texas, the 35th President of the United States, John F. Kennedy, was assassinated. On February 21, 1965, one week after his home was firebombed, Malcolm X was shot to death by Nation of Islam members while speaking at a rally of his organization, the Organization of Afro-American Unity, in Manhattan’s Audubon Ballroom in New York City. On April 4, 1968, at the age of 39, Dr. Martin Luther King, Jr. was assassinated at the Lorraine Motel in Memphis, Tennessee. And on June 6, 1968, while campaigning for the presidency, Robert F. Kennedy, “Bobby,” was assassinated in the Ambassador Hotel, Los Angeles, California. All of this was regular television. We were in the thick of things in Vietnam, which lasted until the fall of Saigon, April 30, 1975 – three years after I first registered for the draft and missed being sent when I was 15 numbers off in the lottery. Richard Nixon was inaugurated as president on January 20, 1969, sworn in by his onetime political rival, Chief Justice Earl Warren. On January 5, 1972, Nixon entered his name on the New Hampshire primary ballot, effectively announcing his candidacy for reelection. At some point in the spring, I think it was, Nixon came through Garden City, Long Island, a Republican enclave in Nassau County, and I managed to shake his hand. He didn’t get my vote – no one did that year. I didn’t vote. By June 17, 1972, The Washington Post was breaking the Watergate Story. The murders of the Kennedy’s, King and Malcolm X, the Vietnam War, Civil Rights, Women’s Rights, Gay Rights – and Nixon – were a perfect storm that changed the semblance of America until our very day. We haven’t recovered. We haven’t fully realized what materialized since. But the spectacle of violence was in place – and getting stronger, growing exponentially with broadcast technologies. Football was fast becoming America’s game because America was fast becoming a media-centric society. And our attention was narrowing. The Sports Broadcast Act of 1961 was passed in response to a court decision which ruled that the NFL‘s method of negotiating television broadcasting rights violated antitrust laws. The court ruled that the “pooling” of rights by all the teams to conclude an exclusive contract between the league and CBS was illegal. 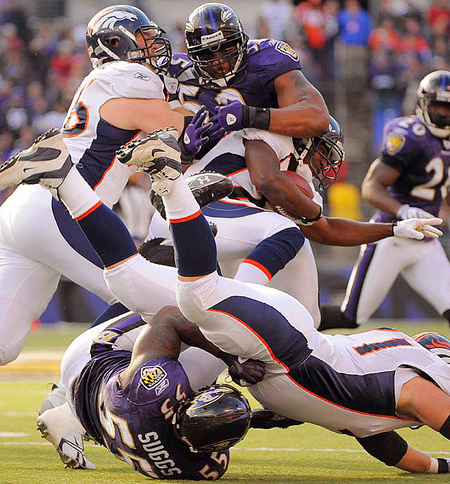 The Act overruled that decision, permitting certain joint broadcasting agreements among the major professional sports. Football’s potential was in its infancy. The road ahead was clear. It’s been television that’s brought the NFL to prominence, along with a spectacular way of passively transmitting the dominant culture’s ruling ideologies. Since then, NFL broadcasts have become among the most-watched programs on American television, and the financial fortunes of entire networks have rested on owning NFL broadcasting rights. This has raised questions about the impartiality of the networks’ coverage of games and whether they can criticize the NFL without fear of losing the rights and their income. 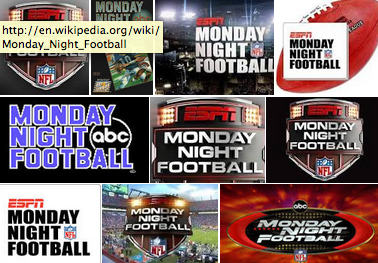 Monday Night Football first aired on September 21, 1970, with a game between the New York Jets and the Browns in Cleveland. This brought ABC Sports producer Roone Arledge’s dream of creating an entertainment “spectacle” as much as a simple sports broadcast to fruition. Advertisers were charged $65, 000 per minute by ABC, a cost that proved to be a bargain when the contest collected 33 percent of the viewing audience. Before we knew it, the spectacle became how we experienced life in the U.S.. Programs such as the Kardashians and the Real Housewives of (fill in your city) were born then. They all work on the same soap opera narrative model, something NFL coverage excels in. Monday Night Football ushered in a new era of television and I was further away from fútbol than ever before, though I was playing in a small community league, coached by a Scotsman. It was soccer all the way. The Scotsman tried playing an orderly game, a military-like, precision game of mid-range passes, very little flair and solid fundamentals. It didn’t sit well with me. Remember: I was going to go at this life my way. Soccer in a football culture. I was a foreigner, undocumented, except for a passport, until 1972 when I followed my father into Naturalization. See, because before I wasn’t Naturalized. I felt the Other – foreign – on and off the field. By now, 2013, amidst scandal pertaining to concussions, exposed in the Frontline documentary, League of Denial, where the NFL is compared to the tobacco companies, the National Football League will have revenues “somewhere just north of $9 billion, which means the league remains the most lucrative in th world.” That is up 5.6% – or $500 million – from the previous year, and $1.8 billion (23.4%) more than Major League Baseball ($7.7). This is the America in which I find myself and I’m not sure what I think. If NFL player contracts are about the player’s body – how long will it last? – then how much is a body worth? An NFL game is about crisis and the drama that can be built around this with careful narrative strategies – as in politics. Television and now the Internet have forced new narrative lines to appear, across all professional sports, in order to capture the fan’s gaze. By now I’m wondering what’s left of that wide-eyed 7 year old boy? The violence and brute force that initially overwhelmed my conscience have metamorphosed into an experience that is highly compressed. Reacting to violence, which seems to be so prevalent – and promoted – is, as I write here, now, a major obstacle in every aspect of my life, and I suspect other’s as well. The grace of fútbol is gone from my life – except when I catch a game (hopefully it’s Messi and Barcelona) on TV. Not enough time, a tighter field in which to do open field running, abundant crisis – these mark our lives today. Which is a road to what? Where are we going? I haven’t watched any football this year, except to watch Middlebury College defeat Williams College, 21-14, on October 12, 2013. Perhaps a final act of assimilation into humanity. This entry was posted in 60 Year Old Men, Adaptation, Carlos Vila Photography, Citizenship, cultural studies, Inverted Totalitarianism, Media, men, NFL, philosophy, Photography, politics, Pop Culture, Race and Ethnicity, sport in America, technology, the Kardashians, Violence and tagged aggression and violence, cultural studies, Earl Warren, economy, elitism, Green Bay Packers, Holy Trinity Catholic Church, Images and Media, John F. Kennedy, Media, Myth Today, National Football League, New York City, NFL, politics, United States by hector. Bookmark the permalink. Beautiful and telling, Héctor. I especially love that last line. If we oppose violence, if we speak of equity and fairness and justice–all those things that must have attracted your family to these shores in 1961–then surely we must also stop participating in the violence, by turning our gaze away, calling it out, and working for change wherever we can. By living an ethical life on every level. And that means working against violence in all its guises. Including American football.